Materials: 14K white gold, a 0.236 x 0.118 inch (6x3 mm) marquise-cut red ruby set in a 14K yellow gold bezel in the ladies' ring. SCROLL DOWN to read about the symbolism of these wedding rings. N.B. Prices are indicative and depend on ring sizes, the current gold and gem prices, and the current rates of exchange. Contact us for a customized price quotation if you find a set of wedding or clan rings or a piece of jewelry you are interested in ordering. Please do not forget to mention the item number and the exact ring sizes in case you ask for a price quotation for wedding rings or clan rings. These unique white gold wedding rings are titled waasa-agone inde', which is Anishinaabemowin (Ojibwe) for “a bright fire burns in my heart", or: "bright with flame is my heart". The stylized, white gold feathers of Migizi the Bald Eagle represent Giizhig, the sky and the light of day, and GICHI-MANIDOO, the spirit that lives in all living things. 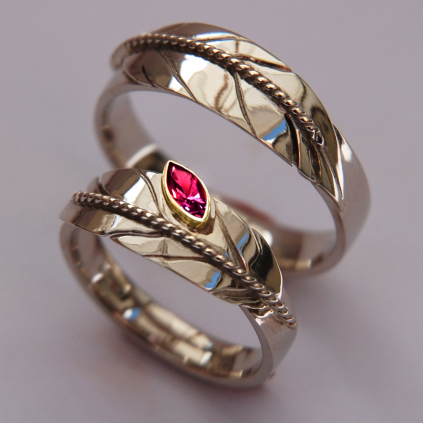 The sparkling red glow of the marquise-cut ruby stone set in yellow gold, gracefully mounted on the white gold feather of the ladies’ ring, symbolizes the south and, particularly, the love fire that, bright and yellow like a waasagone or pumkin flower, burns simultaneously in the hearts of two partners for life. Zhaawan, the southern direction, being an essential part of the circle of life, symbolizes and sustains life that grows toward spiritual as well as physical maturity, and toward adulthood. The south also refers to the period called niibin (the summer), and to the time of day that Migizi, the eagle with the white head, spreads his mighty wings and sores high up in the sky. Zhaawan and grandfather Eagle bring the love couple understanding of GICHI-MANIDOO, the Mystery of Life. I care only for you".